Today is Saturday, December 15th, 2018, and these are your news and notes. 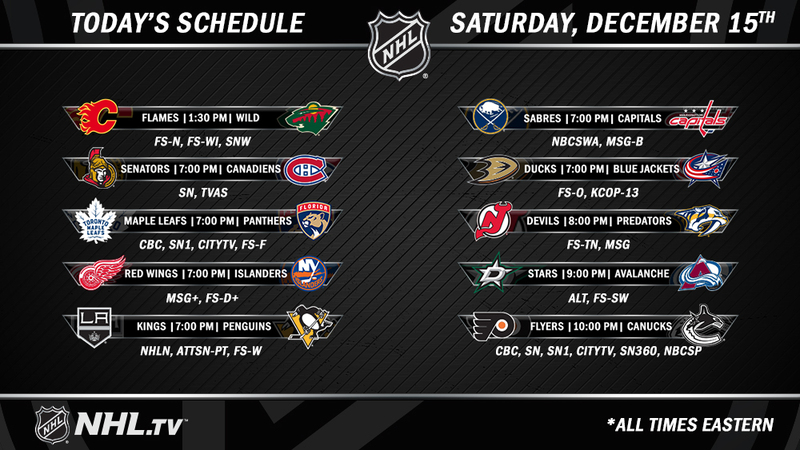 There were eight contests in action yesterday. The Vegas Golden Knights would fall to the New Jersey Devils after be up 4-1. New Jersey Devils would score four unanswered goals with New Jersey’s Nico Hischier scoring the game winner just 41 seconds into the overtime frame. Friday marked the 22nd time in @NJDevils franchise history that the team won a game in which it trailed by 3+ goals. The Arizona Coyotes would also stage a come from behind win after being down three goals in the contest at the New York Rangers last night. It would be the 12th time that the Coyotes franchise would accomplish this and the 29th time overall in franchise history. It was a storybook ending for former Ranger Derek Stepan last night at The Garden. For the Rangers, goalie Henrik Lundqvist would register 30 saves on 34 opportunities. In an amazing performance, Pittsburgh Penguins goalie Casey DeSmith became the third goalie in the last 20 years to have a game in which he had at least 48 saves. DeSmith joins Jeff Zatkoff and Ty Conklin. That's three straight wins at home! Boston Bruins goalie Jaroslav Halak had a performance of 23 saves on 28 save chances. The Ottawa Senators would go on and get the road win when they would defeat the Detroit Red Wings 4-2 last night at Little Caesars Arena in downtown Detroit, Michigan last night. Detroit Red Wings goalie Jimmy Howard would have 28 saves in the contest and Ottawa Senators goalie Craig Anderson would have a performance of 26 saves on 28 save chances. After the Washington Capitals would be down 4-1 at 6:41 mark in the second period, the Capitals would tie the game 4-4 toward the end of the second period. Washington Capitals captain Alex Ovechkin would have consecutive games in which he would have a hat-trick, and now has 28 goals on the season. When Ovechkin scored the power-play goal in the third period at the 9:49 mark, it would be his 237th career power-play goal. He now ranks at seventh place on the all-time list for power-play goals. With his 237th career power play goal, Alex Ovechkin has passed Mario Lemieux (236) for seventh place on the NHL's all time power play goals list. Finally, for the Washington Capitals, Jonas Siegenthaler registered his first NHL point with the assist on Alex Oveckin’s goal at the 3:56 mark in the first period. TXHT has your full game recap of the contest between the Washington Capitals and the Carolina Hurricanes at the following page. The St. Louis Blues would go on to defeat the Colorado Avalanche in overtime with the 4-3 win at home last night. At the 2:05 mark in the overtime period, St. Louis Blues Ryan O’Reilly would cap off a two-point night when O’Reilly scored the game winner. Also in the contest, Colorado Avalanche’s Mikko Rantanen would register his 40th assist on the season with the secondary assist on J.T. Compher’s eighth goal on the season at the 13:10 mark in the third period. Chicago Blackhawks captain Johnathan Toews would net two goals, but it would not be enough as the Blackhawks would fall to the Winnipeg Jets 4-3 at United Center in Chicago, Illinois last night. The Jets Mark Scheifele would net his sixth overtime winner, which is good for third place in franchise history. Scheifele now only trails Ilya Kovalchuk and Dustin Byfuglien for the career lead. Connor McDavid would have two goals, and an assist, good for his 34th career three-point performance. It is now ranked tied for fifth place for most three-point games before one’s 22nd birthday. 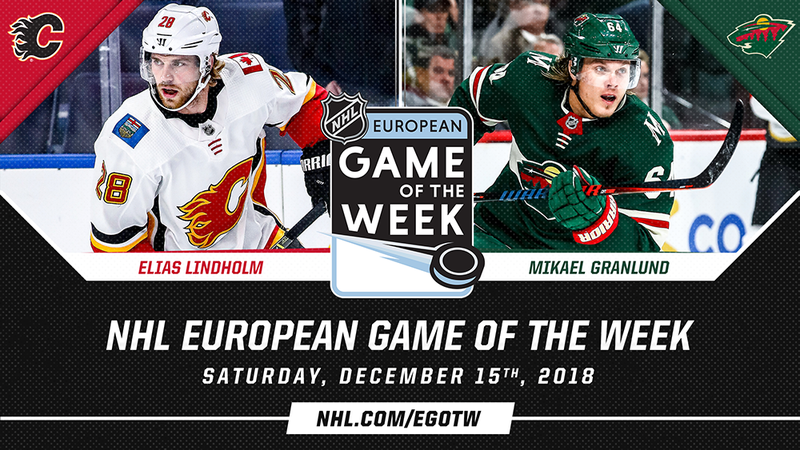 This Week’s NHL European Game of the Week features the Calgary Flames facing off against the Minnesota Wild. Images are the property of the NHL, NHL Public Relations, and NHL Media. With the comebacks last night, this has been the season of come-from-behind wins. The Philadelphia Flyers and Pittsburgh Penguins would both unveil thier logos that will be used for the upcoming Stadium Series game on February 27th, 2019. The logos are “stripped-down” versions of their current logos. The jerseys will be released at a later date.